Minnesota Vikings running back Adrian Peterson told Dallas Cowboys owner Jerry Jones in a June telephone call he would like to play for the Cowboys at the end of his tenure with the Vikings, according to an "Outside the Lines" report. "Well, I understand, Adrian," Jones told Peterson during the call. "I'd like that, too ... Well, I love your story. I love your daddy's story. I've always respected what you've been about. I've always been a fan of yours." The telephone call is recounted as part of an expansive "Outside the Lines"/ESPN The Magazine profile of Jones by ESPN senior writer Don Van Natta Jr. that was published Thursday. 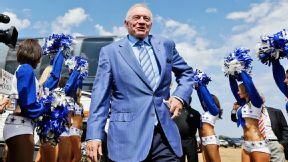 The story also details Jones' lingering angst over passing up quarterback Johnny Manziel in the NFL draft and Jones' continued emotion over former Cowboys head coach Jimmy Johnson, who Jones says will not be put in the Cowboys' "Ring of Honor" that recognizes contributors to the franchise's success. READ 'JERRY FOOTBALL': A longform profile of Cowboys owner Jerry Jones, from "Outside the Lines" and ESPN The Magazine, here. WATCH 'OUTSIDE THE LINES': At 9 a.m. (ET) Sunday on ESPN, "Outside the Lines" will air a television profile of Jones and feature a discussion between reporter Don Van Natta Jr. and host Bob Ley. READ ESPN The MAGAZINE: The Jones profile will appear in ESPN The MAGAZINE's "Renegades" issue, which hits newsstands on Sept. 5. As for the Peterson call, Van Natta was in Jones' suite at AT&T Stadium when a friend of Jones handed the phone to him. Peterson had talked first to a Morgan Stanley money manager who had attended George Strait's final concert on June 7 at AT&T Stadium. After the concert, Jones and several others remained in the suite; Peterson talked with the man, who handed the phone to Jones without saying who was on the line. "Well, we'll see what we can do, if we can make that happen," Jones, who is also the Cowboys' general manager, told Peterson. "Hmm hmm ... I'd like that, too ... Well, we're talking pig Latin here, but let's see if we can do that ... We're talking pig Latin here, but let's see what we can do about that. OK, Adrian, thanks." Peterson, 29, is in the fourth year of a seven-year, $100 million contract that will pay him $11.75 million this autumn to play for the Vikings. "It was good talking to him," Jones said. "I'm a big admirer of him. We were talking about Texas. I really love his story, especially as to how it relates to his father. That's mostly what we talked about. Certainly, that was about it. It was after the George Strait concert. I think it was about an hour after the concert, so that was the atmosphere." The NFL's rules on player tampering lay out specific steps to take if a team is contacted by a player who is under contract with another team: "... the contacted club must immediately report such contact to the owner or operating head of the club which holds the player's rights." Failure to do so can result in "severe" penalties from the commissioner's office. Jones, who confirmed that Peterson told him he wanted to play for the Cowboys, said he has not talked with Peterson since the call and that he didn't think the discussion should be considered tampering. This week, he said he did not contact the Vikings about the conversation. "None whatsoever," Jones said when asked whether he was concerned the NFL could investigate him for tampering. "I understand the tampering thing, and you have to be an initiator." Peterson released a statement Thursday afternoon through the Vikings. "This was a casual conversation between NFL colleagues in which I never indicated I wanted to leave the Vikings," the statement said. "I have always said I understand the NFL is a business but that I would love to retire as a Viking." The Vikings said in a statement: "We are focused on the 2014 season, and as we have consistently communicated, Adrian is an integral part of the Vikings organization." It is not the first time Peterson has talked about playing in Dallas. In December, he told ESPN Radio's Ryen Russillo on the "SVP & Russillo" show: "I'd be a liar to sit here and say it hasn't crossed my mind before. Being from Texas, I've always wondered what it would be like to play in Dallas -- play back home." Peterson was born in Palestine, Texas, which is about 110 miles southeast of Dallas. The timing of the Jones-Peterson conversation came a month after Jones and the Cowboys passed on Manziel with the 16th pick of the NFL draft. In his story, Van Natta writes that passing on Manziel for offensive tackle Zack Martin stuck with Jones all summer. "If we had picked Manziel, he'd guarantee our relevance for 10 years," Jones said in May. "When we were on the clock, I said if we pick the other guy -- any other guy -- it would be a ticket to parity, more 8-8 seasons. "The only way to break out is to gamble -- take a chance with that first pick, if you wanna dramatically improve your team. That's why I wanted Manziel but I was the only guy who wanted him. I listened to everybody ... And I'm ... not ... happy ..."
In the story, which airs on "Outside the Lines" at 9 a.m. (ET) Sunday on ESPN and hits newsstands Sept. 5, Van Natta also writes at length about Jones' continued frustration with former Cowboys coach Johnson. Jones fired Johnson in March 1994, two months after the Cowboys won their second straight Super Bowl trophy. "There was just an undermining that went on," Jones said in the story. "It's subtle. It's smart. ... I lost my tolerance of having an associate, a friend, not be loyal." Information from ESPNDallas.com's Tim MacMahon was used in this report.